Allison (Hannah's Sister) was able to go the store and purchase all of the activities for the hospital. 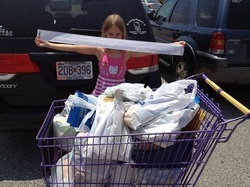 She is proudly showing off the LONG receipt. June 2013 we took our first 50 activity bags to Cardinal Glennon. 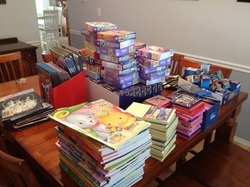 We filled the bags with coloring books, stickers, puzzles, crayons, and other items to give the kids fun activities while receiving treatments at Cardinal Glennon. 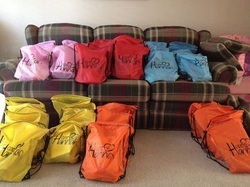 Our foundation was able to purchase bags that families could use to carry all the activities to and from the hospital.